When it comes to biomolecules, RNA doesn’t get a lot of love. Maybe you haven’t even heard of the silent workhorse. RNA is the cell’s de facto translator: like a game of telephone, RNA takes DNA’s genetic code to a cellular factory called ribosomes. There, the cell makes proteins based on RNA’s message. But RNA isn’t just a middleman. It controls what proteins are formed. Because proteins wiz around the cell completing all sorts of important processes, you can say that RNA is the gatekeeper: no RNA message, no proteins, no life. In a new study published in Nature, RNA finally took center stage. By adding bits of genetic material to the E. Coli bacteria, a team of biohackers at the Wyss Institute hijacked the organism’s RNA messengers so that they only spring into action following certain inputs. The result? A bacterial biocomputer capable of performing 12-input logic operations—AND, OR, and NOT—following specific inputs. Rather than outputting 0s and 1s, these biocircuits produce results based on the presence or absence of proteins and other molecules. When given a specific set of inputs, the bacteria spit out a protein that made them glow neon green under fluorescent light. But synthetic biology promises far more than just a party trick—by tinkering with a cell’s RNA repertoire, scientists may one day coax them to photosynthesize, produce expensive drugs on the fly, or diagnose and hunt down rogue tumor cells. This isn’t the first time that scientists hijacked life’s algorithms to reprogram cells into nanocomputing systems. Previous work has already introduced to the world yeast cells that can make anti-malaria drugs from sugar or mammalian cells that can perform Boolean logic. Yet circuits with multiple inputs and outputs remain hard to program. The reason is this: synthetic biologists have traditionally focused on snipping, fusing, or otherwise arranging a cell’s DNA to produce the outcomes they want. But DNA is two steps removed from proteins, and tinkering with life’s code often leads to unexpected consequences. For one, the cell may not even accept and produce the extra bits of DNA code. For another, the added code, when transformed into proteins, may not act accordingly in the crowded and ever-changing environment of the cell. What’s more, tinkering with one gene is often not enough to program an entirely new circuit. Scientists often need to amp up or shut down the activity of multiple genes, or multiple biological “modules” each made up of tens or hundreds of genes. It’s like trying to fit new Lego pieces in a specific order into a room full of Lego constructions. Each new piece has the potential to wander off track and click onto something it’s not supposed to touch. Getting every moving component to work in sync—as you might have guessed—is a giant headache. With “ribocomputing,” Green and colleagues set off to tackle a main problem in synthetic biology: predictability. Named after the “R (ribo)” in “RNA,” the method grew out of an idea that first struck Green back in 2012. “The synthetic biological circuits to date have relied heavily on protein-based regulators that are difficult to scale up,” Green wrote at the time. We only have a limited handful of “designable parts” that work well, and these circuits require significant resources to encode and operate, he explains. RNA, in comparison, is a lot more predictable. Like its more famous sibling DNA, RNA is composed of units that come in four different flavors: A, G, C, and U. Although RNA is only single-stranded, rather than the double helix for which DNA is known for, it can bind short DNA-like sequences in a very predictable manner: Gs always match up with Cs and As always with Us. Because of this predictability, it’s possible to design RNA components that bind together perfectly. In other words, it reduces the chance that added RNA bits might go rogue in an unsuspecting cell. Normally, once RNA is produced it immediately rushes to the ribosome—the cell’s protein-building factory. Think of it as a constantly “on” system. However, Green and his team found a clever mechanism to slow them down. Dubbed the “toehold switch,” it works like this: the artificial RNA component is first incorporated into a chain of A, G, C, and U folded into a paperclip-like structure. This blocks the RNA from accessing the ribosome. Because one RNA strand generally maps to one protein, the switch prevents that protein from ever getting made. In this way, the switch is set to “off” by default—a “NOT” gate, in Boolean logic. To activate the switch, the cell needs another component: a “trigger RNA,” which binds to the RNA toehold switch. This flips it on: the RNA grabs onto the ribosome, and bam—proteins. String a few RNA switches together, with the activity of each one relying on the one before, and it forms an “AND” gate. Alternatively, if the activity of each switch is independent, that’s an “OR” gate. “Basically, the toehold switches performed so well that we wanted to find a way to best exploit them for cellular applications,” says Green. They’re “kind of the equivalent of your first transistors,” he adds. Once the team optimized the designs for different logic gates, they carefully condensed the switches into “gate RNA” molecules. 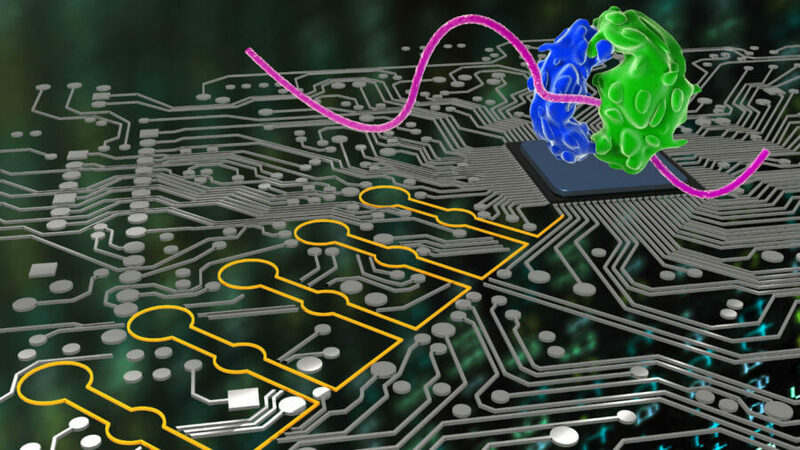 These gate RNAs contain both codes for proteins and the logic operations needed to kickstart the process—a molecular logic circuit, so to speak. If you’ve ever played around with an Arduino-controlled electrical circuit, you probably know the easiest way to test its function is with a light bulb. That’s what the team did here, though with a biological bulb: green fluorescent protein, a light-sensing protein not normally present in bacteria that—when turned on—makes the microbugs glow neon green. In a series of experiments, Green and his team genetically inserted gate RNAs into bacteria. Then, depending on the type of logical function, they added different combinations of trigger RNAs—the inputs. When the input RNA matched up with its corresponding gate RNA, it flipped on the switch, causing the cell to light up. Their most complex circuit contained five AND gates, five OR gates, and two NOTs—a 12-input ribocomputer that functioned exactly as designed. That’s quite the achievement. 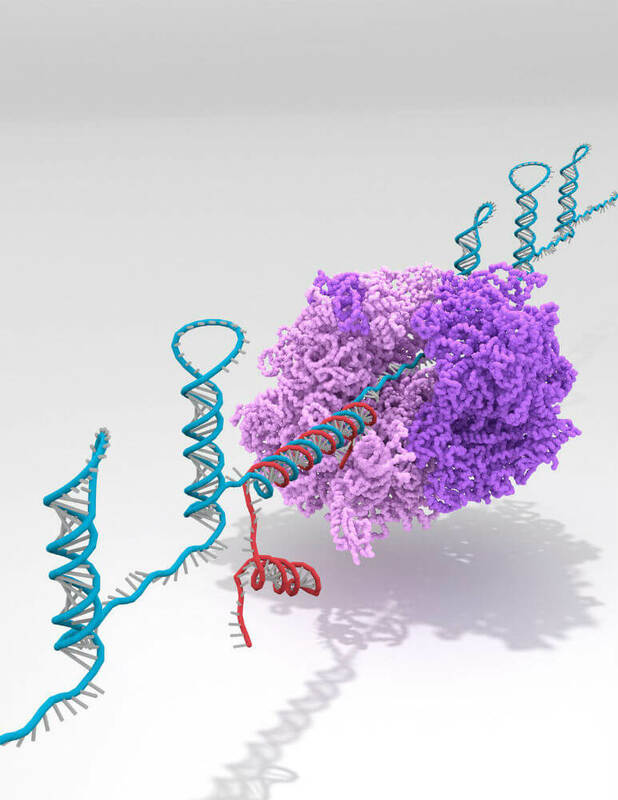 “Everything is interacting with everything else and there are a million ways those interactions could flip the switch on accident,” says RNA researcher Dr. Julies Lucks at Northwestern University. The specificity is thanks to RNA, the authors explain. Because RNAs bind to others so predictably, we can now design massive libraries of gate and trigger units to mix-and-match into all types of nano-biocomputers. Although the technology doesn’t have any immediate applications, the team has high hopes. For the first time, it’s now possible to massively scale up the process of programming new circuits into living cells. We’ve expanded the library of available biocomponents that can be used to reprogram life’s basic code, the authors say. What’s more, when freeze-dried onto a piece of tissue paper, RNA keeps very well. We could potentially print RNA toehold switches onto paper that respond to viruses or to tumor cells, the authors say, essentially transforming the technology into highly accurate diagnostic platforms. But Green’s hopes are even wilder for his RNA-based circuits. “Because we’re using RNA, a universal molecule of life, we know these interactions can also work in other cells, so our method provides a general strategy that could be ported to other organisms,” he says. Ultimately, the hope is to program neural network-like capabilities into the body’s other cells. Imagine cells endowed with circuits capable of performing the kinds of computation the brain does, the authors say. Perhaps one day, synthetic biology will transform our own cells into fully programmable entities, turning us all into biological cyborgs from the inside. How wild would that be?